That you should not be there when something we’ve both wanted happens is no new thing for me. Today too, as always, you’re not here. When you came into our lives, I was in a strange frame of mind. I would have been willing to befriend anyone my age. I was ready for friendship with someone who only read management books; or someone who was studying information technology; or someone who wanted to settle in the United States. Anyone. You came as a paying guest. You gave my parents the rent. You gave me so much more. Then you slipped away. Those shrill girls in the hostel next door, weren’t they keeping an eye on us? I’m now going to sit on the wall, and when my coffee’s drunk, I’m going to scrape the dried coffee off the rim and the squelch at the bottom of the mug with a fingernail and then I’m going to lick it off. When that’s done, I’m going to take off my shirt and continue to sit here. One of the fundamental rights of mankind should be that of wearing as many or as few clothes as one likes inside one’s own home. Or one should be able to wear none at all. Wasn’t the eye that the shrill girls in the hostel kept on us an invasion of our privacy, an abrogation of our rights? After a bath in cold water, you would wrap a towel around yourself and sit on the low wall, bringing with you the smell of soap. It was you who broke my habit of going straight down for breakfast after bathing and getting fully dressed. Another of my habits you broke: my daily accounts. I’d write them down faithfully. Rs 40 for coffee; Rs 100 for petrol. ‘Why keep accounts?’ you asked once. I asked Baba the same question in the night. Baba’s answer was so stupid, I felt a spurt of sympathy for Aai. That night, I went for a walk and ate a paan; and I did not write down how much I spent on it. We hit it off immediately; neither of us liked the kind of girl who would sing syrupy light classical music—bhav geet; nor the kind of boy who would wear banians with sleeves. There was another thing I didn’t like: marriage. And the many relatives who made it their business to discuss the subject ad nauseam. You had no relatives. We would both have liked this moment. We knew that it would be ours one day. But it is now mine alone. When I woke up, my eyes opened peacefully. I felt the kind of peace you feel when you come in from a hot afternoon and pour cold water over your feet. When I opened my eyes, the day stretched before me, free of anxiety. When I opened my eyes, nothing was left of the night’s anxieties. My eyelids floated up. To wake quietly from a deep sleep is a rare thing and, when it happens, you can almost imagine that the world had begun again, at least for a few seconds. Or so you said. Today, when I woke up, my eyes drifted open. I felt the kind of peace you feel when you come in from a hot afternoon and pour cold water over your feet. But when I was making coffee a line inscribed itself on my forehead; and I began to think: Why this peace? Shouldn’t I be crying? Throwing a tantrum? Complaining to someone? Your stuff was all over the room: cloth bags, easel, guitar, books, cassettes, camera, Walkman, rolled-up canvases, and a book of pasta recipes. Baba had finished his fifth cup of tea. Aai was making the sixth. Aseem was in bed. In the next two years, how much did you find out about my sister, a girl whose idea of fun was a strenuous trek to a fort, who grinds your fingers in a painful grip when she shakes your hand, who snores a little in her sleep, who listens with complete attention as if you were the last person in the world? But that’s my Anuja. Who is your Anuja? When did you get to know her? How? And how could I have been so blind right up to the end? When you were giving Anuja the ten rupees, I was up in the tower room, picking up the shirt you had dropped, inhaling your scent from it. When you came up, I was looking through your albums. I hadn’t even thought of it as an invasion of privacy. You came up behind me and put a hand on my shoulder and said quietly, ‘That was taken a couple of days before the accident; the last photo.’ My Marathi-medium school had not taught us to say, ‘I’m sorry for your loss’ at such moments. I hope I took hold of your hand then and gripped it tight. Can a single day bear the burden of so many random firsts? You spent all your Diwali vacations with uncles of various stripes. You ate your meals in hostel messes and, at each new halt, you found a roadside stall at which you could get your morning tea. You made yourself at home easily when you lived with us. It must not have been new, this living as a paying guest. I had had my eye on that room, a dark one but well ventilated. Its main attraction was that it had its own access. I had assumed that it would be mine when I grew up. I would be able to come and go as I pleased. I would paint it the colours I wanted; decorate it the way I wanted. I would sleep in it, alone. But of course, that was the very room that my parents decided would attract a paying guest. And so I had showed this room to many potential residents, my face dark with resentment. When I was a schoolboy, this was the room of my grandparents’ illness. There were two low cots ranged against opposite walls, my grandmother on one, on the other my grandfather. Then only grandmother remained, the room suffused with the smell of Amrutanjan. After she had suffered all her karmic share of suffering, phenyle drove out the other smells: of the ageing body and drying behada bark, of supari and medicine. But the smell of Amrutanjan lingered. That’s when I realized that smell is a matter of the mind. What smells you brought with you! Rum and cigarettes, your sweat and macaroni cooking on the hotplate, and then, because I loved it, attar of khus. And the smell of you, a unique personal smell of your own. When I think of you, that smell comes flooding back. You came into the room and said, ‘What a tempting aroma this room has.’ I thought, if this chap takes the room, things might get interesting. I filled my chest with the smell of the room. Then you said, ‘Do you come here to sneak cigarettes?’ I realized that smell is a matter of the mind. Nothing is real. 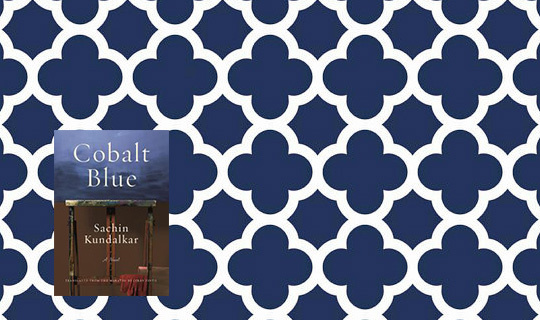 Cobalt Blue has just been released in bookstores. Click here for more information about the book. Sachin Kundalkar is a novelist, playwright, and filmmaker who won a National Film Award for Best Screenplay for the film Gandha in 2008. He lives in Mumbai. Jerry Pinto’s debut novel, Em and the Big Hoom, won the 2012 Hindu Literary Prize, and his novel Helen won a National Film Award for Best Book on Cinema in 2007. He lives in Mumbai.